Some people believe that stars are made while others believe they are born; well, in the case of Ezekiel Elliott, it’s only fair to believe he’s a product of both. The NFL star came from a lineage of successful athletes and has equally paid his dues when it comes to getting it right in the football field. The running back is a strong visionary player who has the ability to excel in every facet of the game. He garnered huge attention in 2017 following his alleged involvement in a case of domestic violence with his ex-girlfriend. As a result of the league’s investigation, Ezekiel was banned for six league games. Learn more about him below. Ezekiel Elliott is an American football playmaker, known for fast-running abilities. He began his professional career in 2016 when he joined the Dallas Cowboys via the NFL draft. Meanwhile, he finished his collegiate career at Ohio State University where he was crowned the Big Ten MVP in 2015. The outstanding player has completed three professional seasons with the Cowboys during which he was named to the Pro Bowl twice. In addition to that, Ezekiel also led the league in rushing yards for two seasons – in 2016 and 2018. 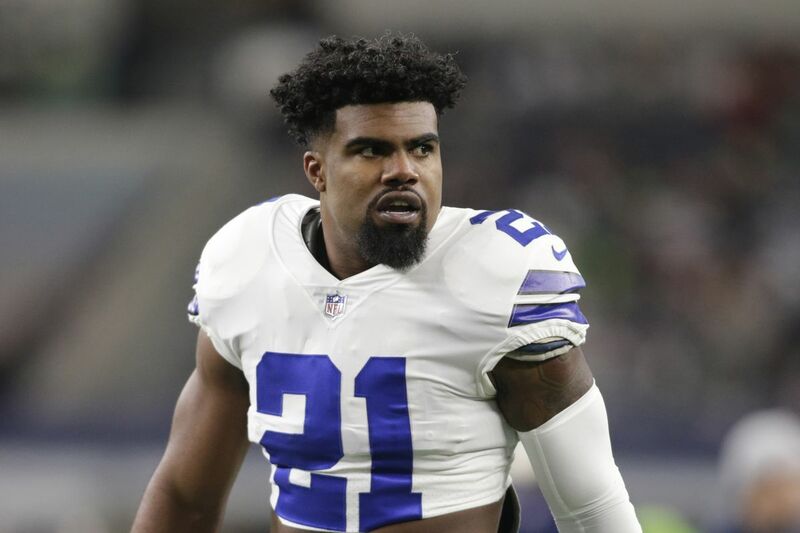 Born Ezekiel Elijah Elliott on the 22nd day of July 1995, the NFL star’s place of birth was in Alton, Illinois, United States. He came from a lineage of successful athletes, his father Stacy Elliott played college football for the Missouri Tigers while his mother Dawn, was equally a standout athletic champion at Missouri University. Growing up, Ezekiel was raised along with his two sisters – Lailah and Aaliyah. At a young age, he enrolled at John Burroughs School in Ladue, Missouri. While there, he participated in different sporting activities including basketball, football, and other track events. Soon after he graduated from high school, Ezekiel went to Ohio State University. There, he made giant strides, setting different records in the school. Amazingly, his name appeared on several leaderboards while leading his team to win several championships. Notably, he helped the team to win the Big Ten and National Championships in 2014. He had a total of 3,961 rushing yards, 43 touchdowns, and 58 receptions throughout his three-year career at Ohio. Finishing his college career as one of the top NFL prospects, Ezekiel Elliott joined the draft exercise where he was projected to be among the top picks in the 2016 draft. During the draft, he was the fourth player to be selected overall and his draft rights went to the Dallas Cowboys. He penned down a four-year deal worth $24.9 million with the Cowboys on 18th May 2016. Joining the team, Elliott won the starting shirt, hence making his first professional appearance in their season-opener against the New York Giants. During the game, Ezekiel recorded his first career touchdown and also made 20 rushing attempts for 51 yards. He ended his rookie season making history as one of the few rookies who amassed over 1,000 rushing yards in a season. He also led the league in rushing yards with his 1,631 rushing yards as well as 15 touchdowns and 32 receptions. As a result of his top-notch performance, Ezekiel got his first All-Pro Team and Pro Bowl selections, as well as All-Rookie team honours. The following season, he made 10 appearances for the Cowboys due to some legal issues and only rushed for 983 yards with seven touchdowns that season. He led the league in rushing yards for a second time in 2018 while getting his second Pro Bowl call-up. The player finished the season with a total of 1,434 rushing yards, 77 receptions, and six touchdowns. Now in his fourth professional season, Ezekiel Elliot has earned a decent amount of money since the inception of his career. He penned down a rookie contract worth $24.9 million with the Cowboys in 2016. As a result of this contract, the running back receives a salary of $6.2 million every year. In addition, he also earns from endorsements and other incentives. Prior to the beginning of the 2017 season, Ezekiel Elliott was banned for the first six games by the league management. This happened as a result of his violation of the league’s personal conduct policy. The running back was said to have been involved in multiple domestic violence issues with his ex-girlfriend, Tiffany Thompson. Although the player appealed his suspension and it was kept on hold for a while, he later served the suspension starting from 15th November 2017. He was reinstated in week 16 after missing six regular-season games. The NFL running back has recently been linked to a lady named Halle Woodard. There are no much details online with regards to Halle; the couple is said to have started their relationship in 2017. The news of their relationship saw the light of the day when Ezekiel’s mother posted her picture with Halle on Instagram in December 2017. Meanwhile, Ezekiel has tried his best to keep his love life away from the limelight to avoid being mixed up in controversies as with his former girlfriend Tiffany. 1. Ezekiel Elliot was born and raised in Alton City of Illinois, United States. 2. He came from a lineage of athletic stars. 3. The running back was the fourth overall player to be selected in the 2016 NFL draft. 4. He was banned for six games in 2017 due to domestic abuse allegations from his ex-girlfriend. 5. Elliott is a two-time Pro Bowler and has led the league in rushing for two seasons.